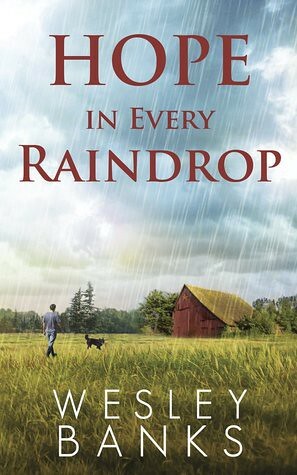 Hope in Every Raindrop was a disappointing read for me. I found it rather boring and didn't really understand why I was reading this story. I wish I could have read Katie's story she is writing as I enjoyed the short snippet that was included much more than what I was reading. It was just a strange read. About dogs that I didn't really get to know or understand what was so special about them, and if the real story is about Kyle then what about him? He was just a quiet guy who trains these dogs and....that is all I know about him. We don't get to know Kyle, but he apparently is the real story here. Okay, maybe it is just as simple as he loves these dogs and trains them and that is amazing. I was just expecting something more. 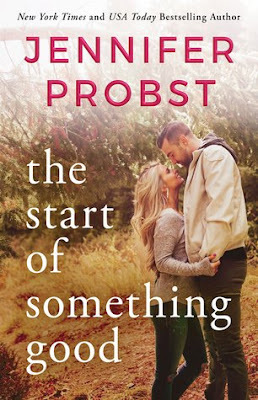 The story opens with Katie stuck with writers block and on a deadline. Her father has recently passed away and the words are not coming. When she finds inspiration in a dart and a map of the US she throws the dart and heads to the town to find a story. Now I really think the writing was a bit off for me. She arrives in town and meets one person and they say something about the magic dogs so she goes out to the farm and ends up staying there. It was all very strangely written for me. The conversations didn't quite feel real and the way she ended up staying there was odd. Doc just says something about how the only place to stay in town is closed and she would have to drive a few hours to the next town then walks inside. She takes that as an invite I guess and that is that. It was just off for me. I didn't understand the characters or how they were acting. So Katie ends up staying on the farm and watching the dogs/helping out with the chores. She is kind of whiney about that, but really she is getting free room and board so you think she might be grateful. The way she talked about the story and the dogs and needing to get to know them was again off for me. None of it felt quite real. I didn't understand what the big deal was or what her book would be about other than a dog trainer. I expected more of an emotional read especially since there were some moments that should have been intense and sad. Only I was just annoyed reading them as how could Katie be so stupid? And if it was really such an intense situation how did everything get resolved the way it did. So the barn where the dogs stay catches fire during a storm. Kyle gets the dogs out of the barn and Katie is supposed to take them inside the house. She does, but she realizes one is missing - the one that roams wherever he wants so of course he is not there. He is probably wandering around somewhere, but Katie thinks he is still in the burning barn so she goes in to look for him. And then climbs up the ladder to the loft for some reason. I was yelling at her in my head like why would you do that? The barn is on fire! He is not in the loft! I know you think Kyle might be up there or something, but what would you do if he was? Die with him? So of course the loft collapses and she falls partly onto the sled and gets knocked out. Kyle was looking for her and gets trapped under some timber that fell on his legs. He can't get out and the fire is getting worse so he gets the rouge dog, his best friend, tied to the sled and in this should have been touchingly heroic moments the dog slowly pulls Katie outside. Only I kept rolling my eyes. Anyways Katie is outside, the dog had too much, his heart couldn't take it, and Kyle is in the burning barn trapped. And the fire is getting worse. Cut to Katie waking up and asking about Kyle and Doc telling her he is fine, the fire got put out by the rain, no big deal. That was really a wait a minute - if it was sooo important for Katie to get out of the barn so she didn't burn to death how did he survive being trapped in there? Either the fire was so fierce it was dangerous and she had to get out, in which case Kyle should have died, or it wasn't that bad, just a small fire that the rain could put out, in which case Katie was safe either way. I didn't understand how it could be life threatening, but also small enough for some rain to put out. Overall not the book for me. I couldn't connect with the character, we never really get to know Kyle or the dogs and they are a big focus of the book. I don't know how Katie and Kyle fell in love or whatever, but apparently they did. I just didn't see it.